Why do children and dogs have to die? Tragically, my inbox is filled everyday with news about children, adults and pets being severely injured and even killed by dogs. Naturewatch Foundation is of the belief that inadequate and out-dated legislation on the breeding and selling of dogs falls at the heart of the UK’s dangerous dog problem. Sadly, there is a lot of evidence to back up the claim that puppies bred by unscrupulous breeders have increased risks of poor health and behavioural problems. Approximately 250,000 dog bites requiring treatment at hospitals occur each year in the UK. Failure of early socialisation at puppy farms is a contributing factor in many of these incidences, as risk of aggression is more likely with poorly socialised dogs. The Breeding and Sale of Dogs (Welfare) Act 1999 allows the sale of dogs which are less than eight weeks old to holders of Pet Shop Licences, further highlighting the negative impact the outdated Pet Animals Act 1951 is having on dog breeding and selling in the UK. Evidence reveals that the separation of puppies from a litter before eight weeks of age causes a significant increase in risk of health and behavioural problems. During my career in animal welfare, I have met some very friendly Pitbulls and some incredibly aggressive Labradors. A dog’s level of aggression has little to do with its breed – instead, aggression is born from a blend of its personality, socialisation and training; and most of all, how it has been bred and treated at the hands of its breeders and owners. Staffordshire Bull Terriers were considered to be a friendly breed until they became the latest ‘status‘ dog and fell into the hands of irresponsible breeders and owners. No child should ever be left alone with a dog - parents need to realise that, whatever breed and however friendly, any dog can harm a child. Naturewatch Foundation is campaigning for stricter laws on the breeding and selling of dogs, because we believe this will stop unscrupulous breeders from selling thousands of dogs that suffer horrendous health issues and behavioural problems. 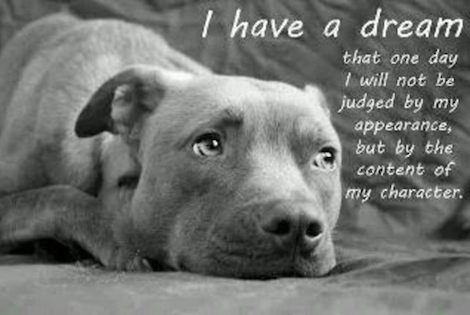 It is tragic that dogs and children have to lose their lives due to irresponsible ownership and breeding.